History of the Bow Chain Saw, the Pulpwood Saw. The begining's of the modern day bow type chain saw can be directly traced back to the the orginal intended use of such a saw, back when it was first invented. 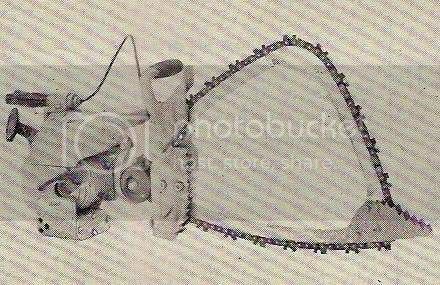 The first bow shaped chain saw, appears to be the 1916 Swedish made Sector. But it and several other bow shaped saws that followed, were just that, bow shaped, but not a bow saw. The bow saw as we refer to it here, was intended mainly for the purpose of a repetitive bucking situation. 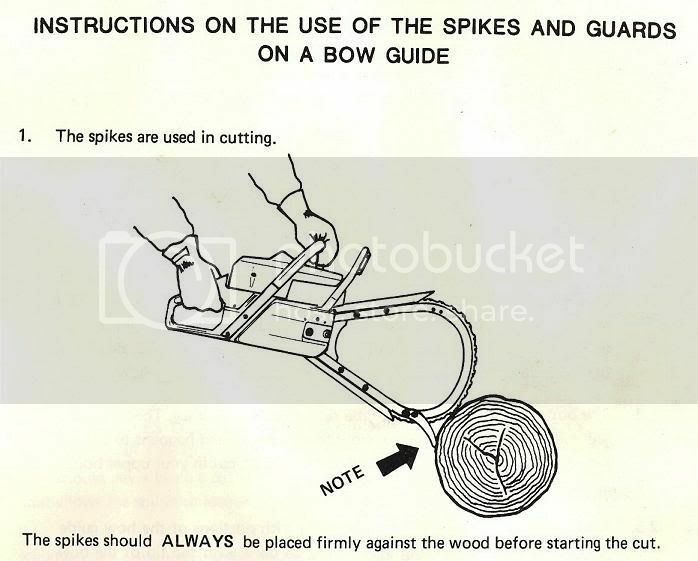 The term "bucking" is the process of cutting a log into sections, short or long pieces. Bow saws were designed mostly for the harvesting of pulpwood, used for the making of paper, usually cut into 4ft. lengths. The paper industry was huge and required large amounts of wood to make paper pulp. Paper mills provided many a woodsman the opportunity to earn a living by cutting pulpwood. The bow type chain saws have a bar that will not bind or pinch in the cut (kerf), it's a saw that was purposely designed to be pinchless. 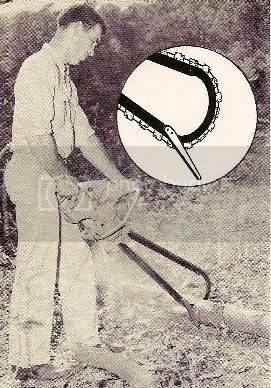 Those early bow "shaped" chain saws such as the Sector were never designed or intended for this purpose, and therefore are not true bow saws, in our opinion. Poulan's creation of the bow bar during WWII is considered the start of the modern day bow type chain saw. The company's history tells a colorful story about how Poulan formed his first working bow bar attachment from an old discarded truck fender. 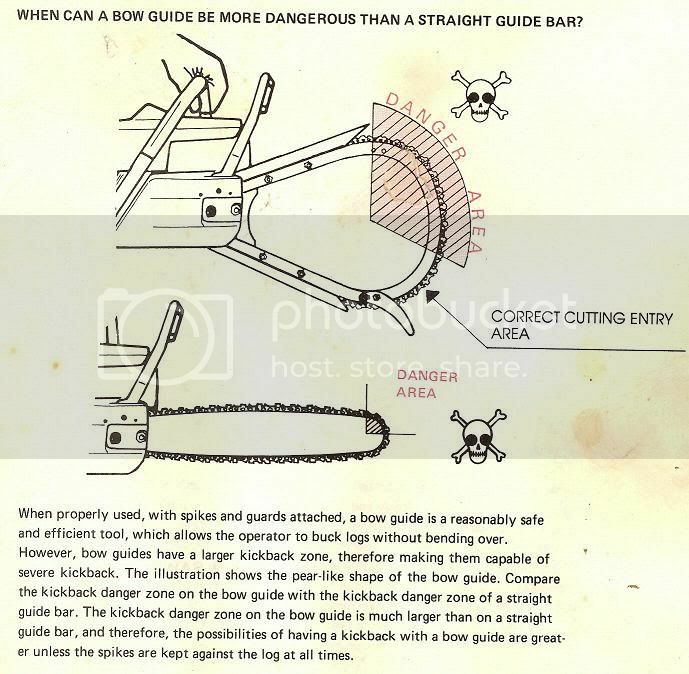 Poulan purposely designed this attachments cutter bar with a downward bow so that it would protrude all the way to the bottom of the log during a cut. He also made the bar thin and narrow to prevent pinching and binding. 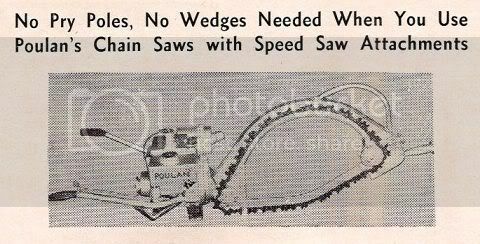 Poulan began selling his bow saw attachments, which he called "Speed Saw" attachments, in 1946. 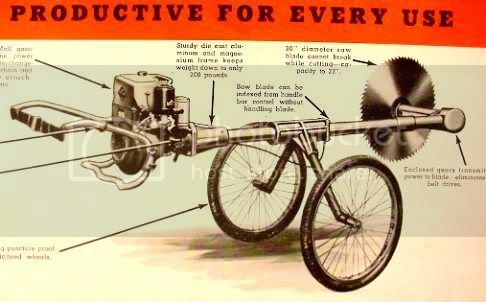 Poulan also began working on a prototype for a complete chain saw of his own, and by mid 1948 the Poulan model 2400 was being offered throughout the south. The first Poulan chain saws, seem to have had a very low total production, we find several factors that could explain why. 2: The model:2400 saw itself was not at all the best, it was big and bulky, making it hard to use and move though the woods. 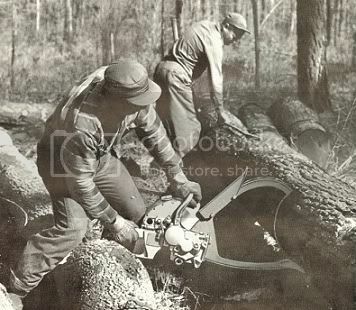 3: Southern loggers of the time seem to have prefered the larger push type circular saws mounted on wheels, that is until the one man type bow saw models came along. 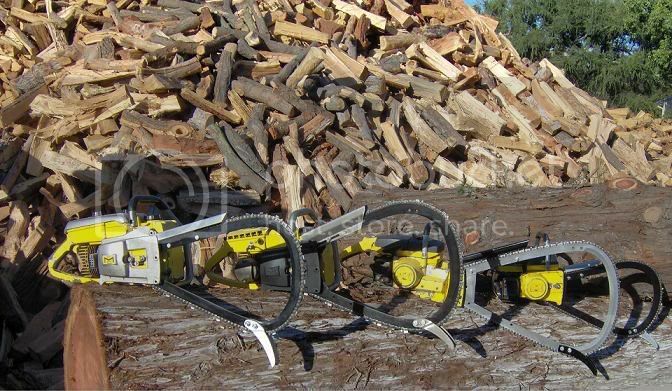 The first bow type chain saw to have a major impact on the saw market was made in the target rich environment of Quebec, Canada, a large pulpwood producing area. From there it expanded sales by moving down through the pulpwood areas of New England, and beyond. 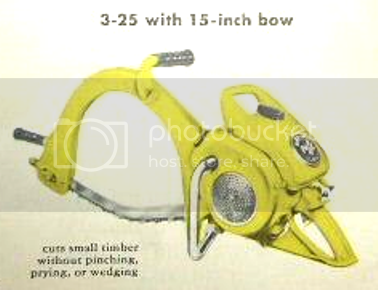 The 1946 Precision saw, was the first one-man gasoline bow saw in the world. 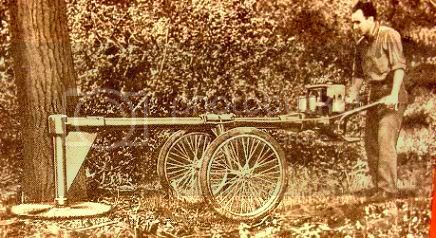 It was a 3.5 hp machine that offered three different bow lengths, it was quickly dubbed "The King of the Woods", because it was fairly light and easy to use. 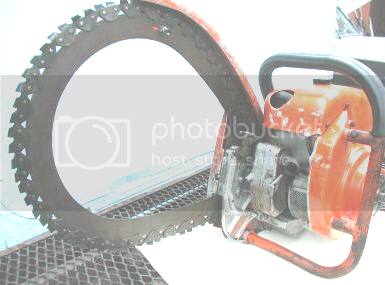 The Precision chain saw was sold by the thousands, and this caught the attention of other manufacturers. 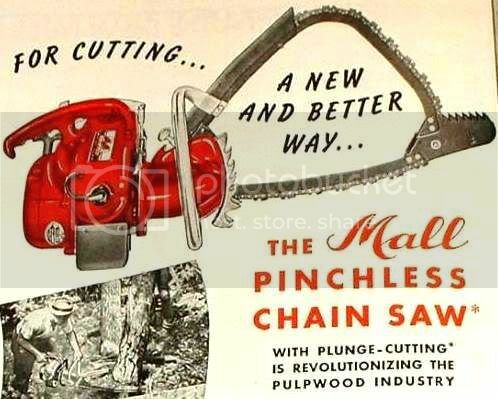 Mall took the next step in the evolution of the bow saw in 1947, when they produced the first one piece (full loop) bow saw. However the importance of this design would not became apparent until years later. Disston entered the bow saw market in 1948 with the introduction of it's one-man model O-100 chain saw, which offered an optional 14" (staddle chain) bow bar. This is believe to be the only staddle type bow ever marketed by any manufacturer. It cut a much wider kerf and therefore was soon abandoned in favor of a standard style chain. Wright Saw, LegDeLimber, farmer steve and 20 others like this. By the fall of 1948 another new chain saw brandname was making it way though the North American woods. 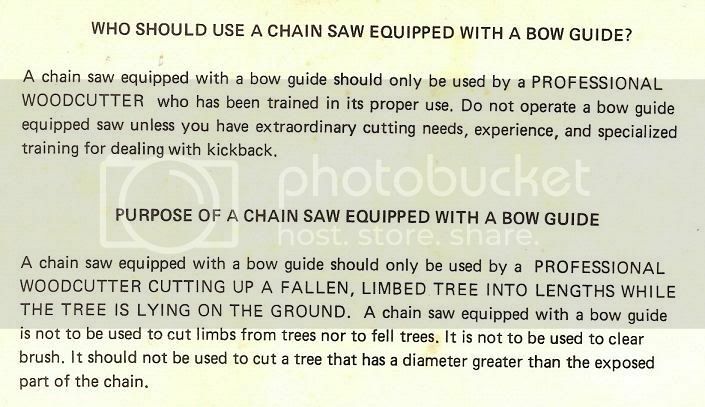 McCulloch had launched it first chain saw in the form of the two-man model:1225A, and they too began to offer a 20" bow saw attachment as an option. 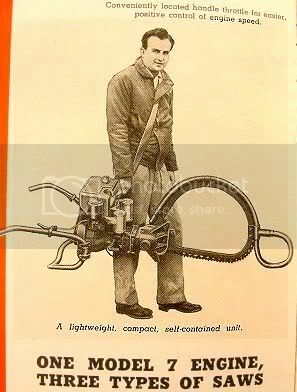 In 1949 McCulloch out did themself's by going one better, when they offered the saw pictured above, in a smaller one man version. The Mculloch model: 3-25 also offered an optional bow bar as pictured below. But for 1949, the biggest developement in the world of bow saws was to arrive by way of Canada again. This time it was the Hornet brand, that began to offer something new. Hornets one-man model:HJ-3600 chain saw was now available with a automatic rewind starter, and their totally new "Two-Way" bow bar. The "Two-Way" bow bar offered two cutting surfaces, the normal bottom edge, used mostly for felling, while the secondary front edge, was for bucking. This new style of bow bar allowed the operator to stand in an upright position while bucking, causing far less fatigue from a long day of cutting pulpwood. Most of the larger chain saw manufacturers in North America had joining the league of bow saw makers by 1950. Mall, one of the first producers of bow saw bars, now quickly became the "The Bow Saw King" offering bow cutting capacities in four sizes ranging from 15 to 32 inches. They offered both one and two man models, that were electric, or gasoline powered. 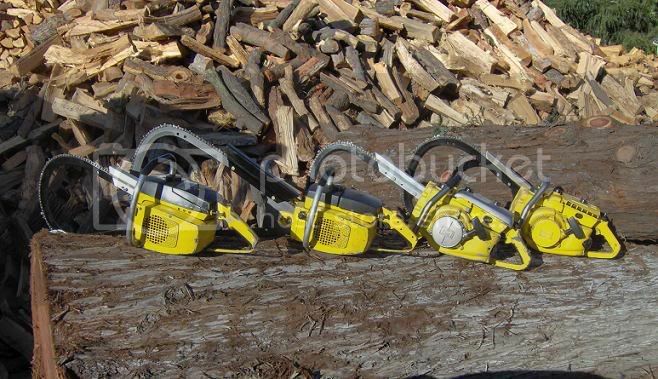 Mall's chain saw line now offered 13 bow saw models, a saw for every situation. Mall purchased Hornet in 1951, adding their "Two-Way" bow bar design to the Mall line-up, dubbing it the plunge bar. By 1953 the plunge type bow bars were being offered by every major chain saw manufacturer as a regular part of their line. 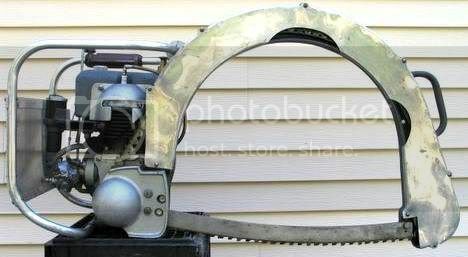 The big bulky two-man saws were now fading into history, being replaced by the newer and lighter one man designs. But the evolution of the bow bar was still under way, and one more big step was just around the corner. Mall introduced their new model:3MG in the fall of 1953, with a totally new bow bar design as optional equipment. This new bow bar was a first look into the future of modern bow bar design. But for some strange and still unknown reason Mall never pushed the design forward with a sales and marketing campaign. The design was discontinued before it ever really got started, and it's full potential was never realized. 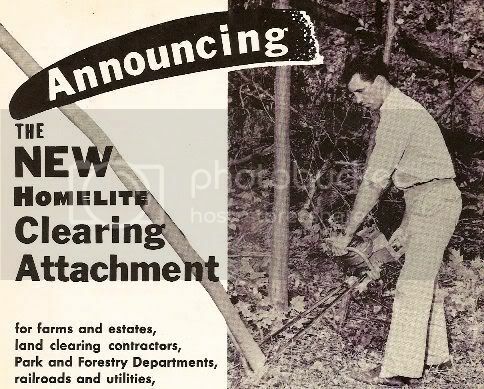 Enter the new would be king of the pulpwood forest, in 1955 Homelite began offering a new bow bar design. A bar with a condensed teardrop shape, Homelite called it the clearing bar. About the same time Homelite also began offering a full loop type bow bar, without the big bulky saw frame that many other manufacturers were still using. With these two bow bar designs, first made by Mall, Homelite cut their way to the top of the pulpwood pile. 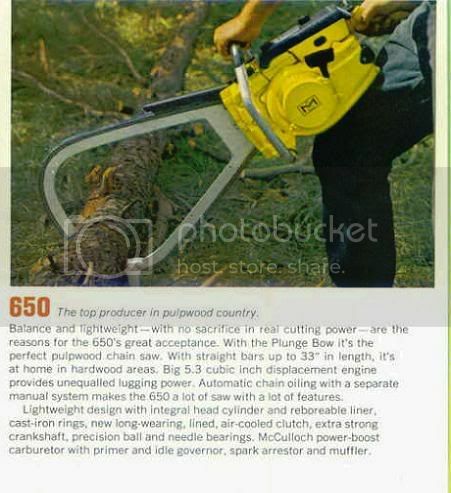 Homelite very quickly became the number one selling brand of pulpwood saws. 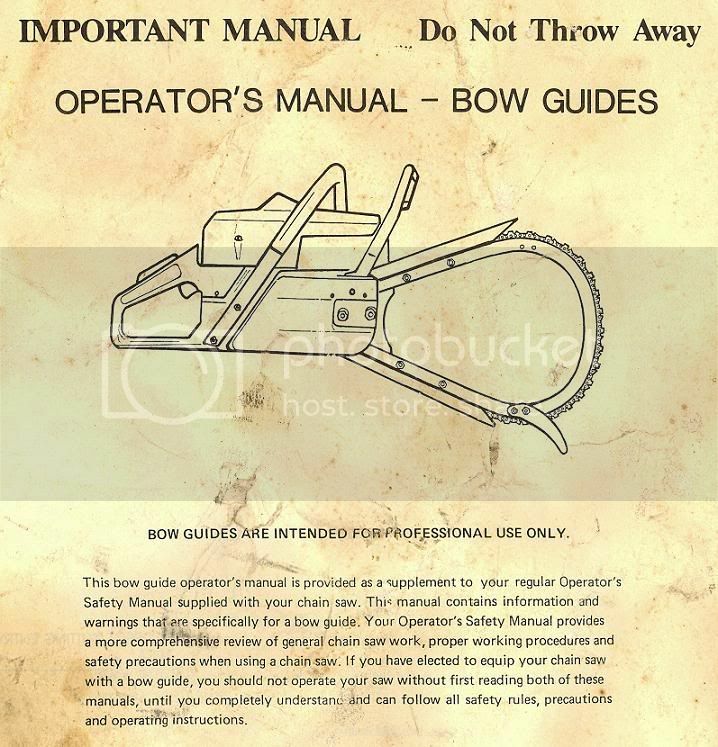 The full loop bow, and the clearing bow became the industries standard, all other manufacturers then had to follow Homelite's lead just to keep pace. 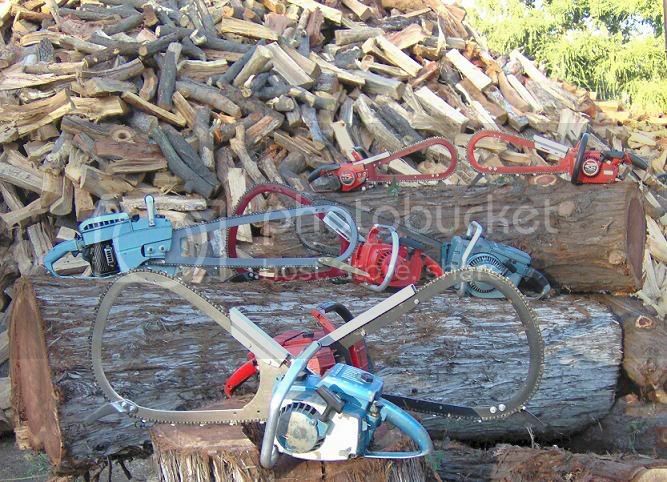 The evolution of the bow type chain saw was now complete, those two designs dominated the market for over fifty years, and are still the standard to this day. 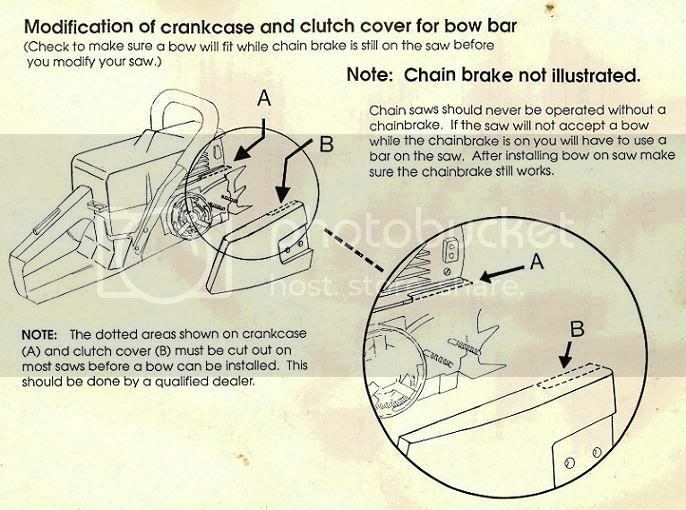 We find that the modern bow chain saw design evolved over a ten year period from 1946 to 1956. We consider that period of time as one of the most interesting for the entire chain saw industry. The war had just ended and the world was switching gears from a place of war time manufacturing, to that of peace time industries. Many companies were looking for product lines to keep their factories busy earning profits, for some the chain saw fit that bill. 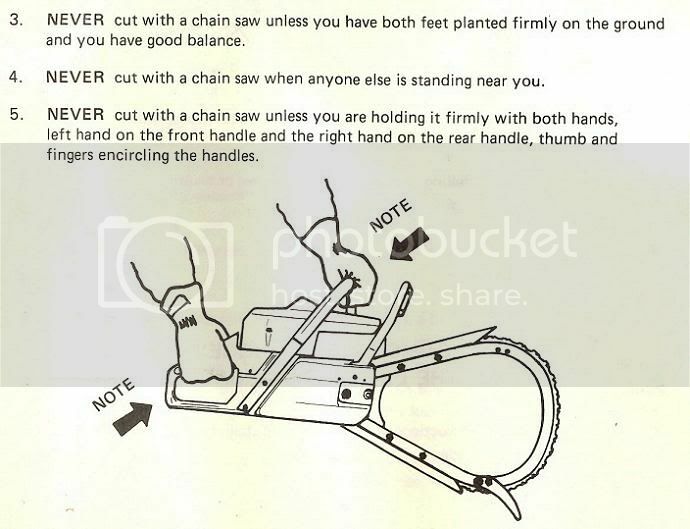 During this period the chain saw went from a two-man machine that cost over five hundred dollars, to a one-man machine that cost around two hundred and fifty dollars. From a gear drive saw to a direct drive one, and from a seldom seen business machine to a rather common tool owned by a variety of people. We hope that you enjoy reading this historical observation as much as we enjoyed compiling it. milkman, hseII, kz1000 and 14 others like this. kz1000, Wright Saw, farmer steve and 5 others like this. kz1000, Wright Saw, farmer steve and 4 others like this. Post your Bow Saw pics and videos in here. kz1000, Wright Saw, farmer steve and 8 others like this. I love those saws. Never seen anything like them! The more I use my new bow bar the more I like it. Nice article Cliff, Thanks for posting. Tom Hawkins is a very knowledgeble guy. Will be seeing him next weekend. Excellent post. Love history. It's very interesting to see the evolution unfold. 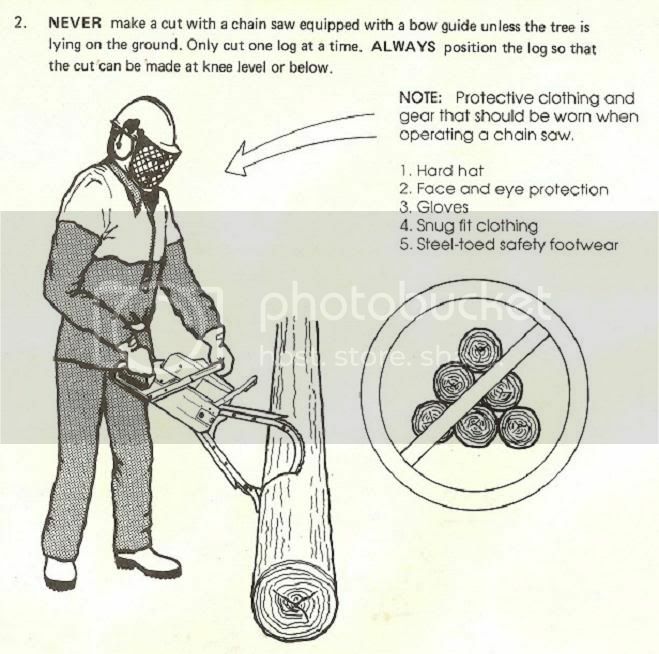 Many thanks for this thread, I never tire of learning more history behind the evolution of the chainsaws. 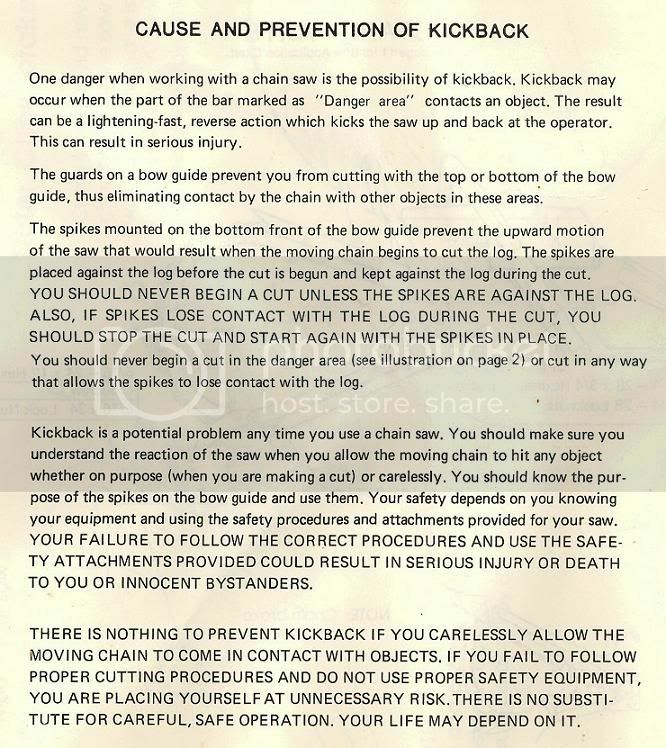 The bow saws being a little more rare in our area so this was a real nice read. Thanks very much for posting this, very interesting. I have lived in the Pacific NW all my life and I have never even seen a bow saw in person. Thanks , as always great reading and great pics ! Thanks for the info, Always great to read. Awesome saws you have too. Thanks Cliff, that was a lot of work to put all that together. Since you asked, here are pictures of my McCulloch 200 with the bow bar.